Connected Health » Uncategorized » Jawbone releases its fitness tracker Up…. Again! Jawbone releases its fitness tracker Up…. Again! 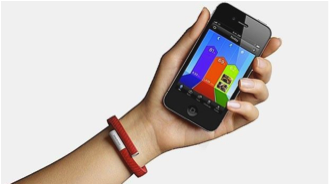 Released more than a year ago was a gadget designed to change the way we look after our bodies and monitor our health. Jawbone Up was created and released in the US in late 2011, however it failed to make an impact due to several variables. Since the product had such a short lifespan, many of you will not know exactly what it does. Well Jawbone Up is essentially a step-monitoring wristband, designed to allow users to track their daily exercise. However now, the product has been completely revamped, creating a sturdier and more productive model. The wristbands come available in eight colours in an attempt to try and make them as fashionable as possible, which I would say they have made a success of, especially compared to other bulky competitors on the market. The band is coil, which clings to your wrist with a connecting point at one of the ends used for charging and syncing. The purpose behind the detector is to improve your overall fitness and by monitoring your steps per day self-motivation should hopefully give you an incentive to keep upping your exercise. Also Jawbone have done their research and found that people whom track their steps end up moving around 26% more than those who don’t, a good sales pitch! The band however does offer other unique abilities, which will separate it from competitors, these include a reminder setting which alerts you to get up and stretch you legs as well as a sleep mode designed to monitor how well and how quickly you fall to sleep. All of the setting can be accessed through the app available on iOS and Android. These are all really useful tips to maintaining a healthy lifestyle, and the only real negative is needing to connect Up with your smartphone before being able to view your progress.